Formerly known as the Nutrition and Physical Activity Coalitions (NPAC), our HEAL community coalitions are working for systemic changes necessary for Hawai‘i residents to participate in a lifestyle of healthy eating and active living. 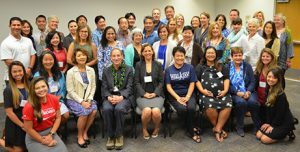 In 2006, Hawai‘i stakeholders from across the state convened and decided that county coalitions were necessary to reach the common goals of reducing overweight, obesity, and chronic disease among all Hawai‘i residents. Our HEAL coalitions are working for a Hawai’i where all residents live in healthy communities, have access to healthy foods, and have safe streets and pathways for physical activity. Membership in the coalitions is free and open to anyone who wants to help support efforts towards healthy eating and active living. Helping Hawai‘i employees become more physically active through stairwell promotion signage, worksite policies, and social support. Obesity and overweight are risk factors for heart disease, stroke, diabetes, cancer, and many other preventable diseases. Yet only a small fraction of children and adults meet national recommendations for physical activity and consumption of nutritious foods to prevent these diseases. The OPTF is no longer bound by statute to convene, however, concerned citizens, public health professionals, physicians and other health care providers to convene and push a policy agenda each year. This year the OPTF has transitioned to the HIPHI and is convened and facilitated by HIPHI staff.